“Our campaign, and only our campaign, continues to be the target of numerous, sustained personal attacks, lies and defamation, which are ramping up in the last week of Burlington’s mayoral race. 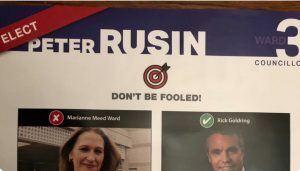 The latest is a flyer slandering me while promoting the current mayor, and a series of Facebook and Instagram ads and videos which use the same slanderous content as the Campaign Research push poll in August/September. “Negative personal attacks and smear campaigns have no place in this election, or any election, anywhere, against any candidate. These tactics divide our community. Every candidate should be condemning this appalling behaviour, especially where it is used to promote their own candidacy. “The public are not fooled, and have told us they are in fact disgusted by this. We’ve been overwhelmed with support from the community, with residents contacting us to say there is no place for these tactics, regardless of how they are voting. “I want to thank the decent people of Burlington for calling for this to stop, and for rising above. Residents will cast their votes based on platform and track record, not lies and slander hiding behind numbered companies and anonymous polls. “The smear campaign will not intimidate or silence us from continuing to speak out for reasonable growth, not overdevelopment, which has emerged as the key issue in this election. We will continue to advocate for our community and for better decisions on development with a new mayor and council who will work with residents. The flyer contains personal attacks and defamatory statements against me while promoting the current mayor. It is paid for by a candidate running for the Ward 3 council seat who is using this platform to attack our campaign. The flyer has been distributed to residents outside Ward 3; there are confirmed reports so far from residents in Wards 1, 2 and 4 who have received it. The information in the flyer is also contained in webpages that are being promoted with sponsored (paid) ads on Facebook. A print ad in the Burlington Post pointed people to the webpages. When the Post learned the content of the webpages (which were not live before press time) they apoloized and removed the online links to the webpages. The Facebook ads and videos which have recently launched use the same slanderous material as the Campaign Research push poll conducted in August/September. The push poll contained personal attacks under the guise of an election survey, while collecting voter preference information from residents for undisclosed purposes. Campaign Research did not disclose who had paid for poll, nor were there any Third Party Advertisers registered with the city at the time. The recent Facebook/Instagram ads, which use the Campaign Research content, are paid for by a numbered company, recently registered as a Third Party advertiser with the city.